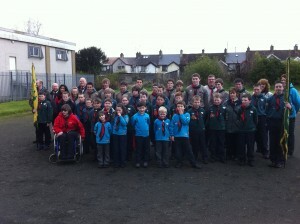 Ballymoney scout group joined Coleraine and the other groups from the district in the annual St Georges Day parade which this year was held in Coleraine. This is the first year that Beavers from Ballymoney have paraded, and all sections provided a great turnout which proudly showed off scouting in Ballymoney. Next year the annual parade will be hosted by Ballymoney.